This weeks Illustrated Women in History was submitted by Ailsa Ross for the Illustrated Women in History exhibition in April 2017 at Swindon Central Library, UK. Volleyball player Arunima Sinha was on the night train to Delhi in 2011 when a group of robbers burst into her carriage and tried to grab her gold chain. She protested — it was a gift from her mom — and the thieves threw her out of the train. Before she could get off the tracks, another train came and ran over her left leg, crushing it below the knee. She had to have it amputated. With lots of practice, Arunima began to walk again. She took a mountaineering course and learned to rock climb with a prosthetic leg. She hiked huge Himalayan mountains like Island Peak in Nepal and Chamser Kangri in India. 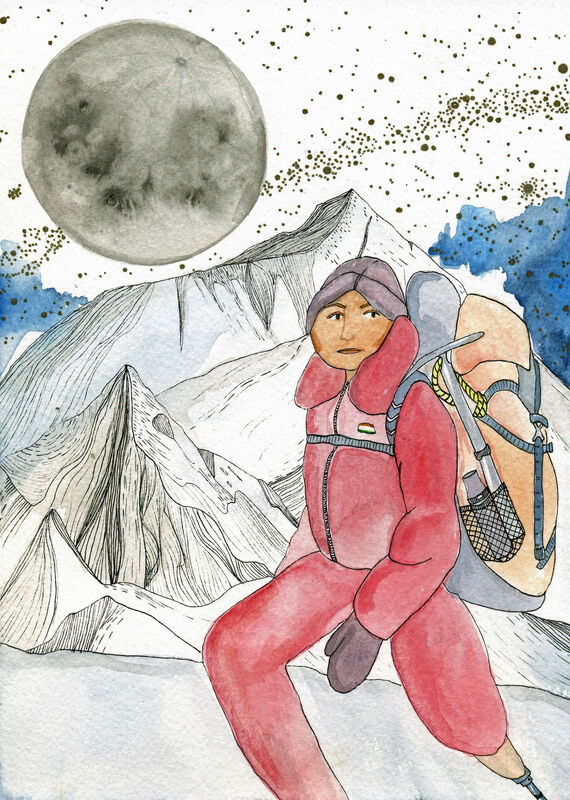 By 2013, she was ready to attempt the tallest mountain on Earth. At 8,848 metres above sea level, the summit of Everest is around the same height passenger planes fly at. The air is very thin, and there isn’t much oxygen to breathe in. That can make it difficult for the brain to work properly and to do even simple tasks like tie shoe laces. There’s also the risk of risk of hurricane force winds, avalanches, and temperatures that can be as low as -76° F. But at 6pm on May 20, Arunima got the message from her Sherpa guides: There was a gap of good weather — it was time to ascend. Because of her leg, Arunima was slower than other climbers. The team leader was worried that her energy and oxygen levels were depleting fast, and he thought it might be best to return. Arunima refused. At a junction near the top she got her confidence back and sped up to the summit. After 17 hours, at 10:55 am on 21 May 2013, Arunima Sinha became the first female amputee to reach the top of the world. But she still had to descend. The effort from climbing meant she was sweating so much her prosthetic limb felt like it would slip off. Arunima couldn’t fix it because she could get frostbite if she took off her gloves. She did what she had to do, and dragged her left foot in the snow all the way back to camp. Arunima made history when she climbed Everest aged 26, but her story is far from finished. She’s now climbing the highest mountain on each of the seven continents, and has already ticked-off five, including Kilimanjaro in Africa, Aconcagua in South America, and Kosciuszko in Australia. Dedicating her climbs “to those who lose hope”, she’s also set up a sports academy for the differently abled in her home state, because if anyone knows how important it is to feel empowered, it’s Arunima Sinha. Ailsa Ross is a Scottish freelance journalist and editor living in the Canadian Rockies. A contributor to National Geographic online, Time Out, Atlas Obscura and many more, she’s currently writing a book about the bold women who’ve gone on big adventures. From surfer princesses to aquanauts and desert explorers, you can chart their brilliant stories on Instagram @womenadventurers.